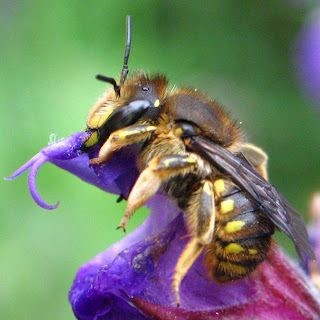 The first time I came across Anthidium manicatum, the Wool-Carder Bee was after hearing it, not the usual humming noise bees make when flying, but that produced by a female's jaws cutting the hairs of a plant I had recently planted in the garden, Lamb's Ears (Stachys byzantina). 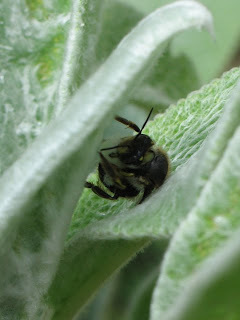 Since then, this has been a plant that has not been missing from the garden, just because it is a sure way of attracting Wool-Carder bees. The contrast between male and female's behaviour couldn't be more stark. 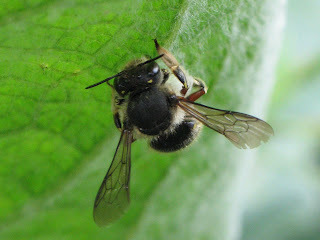 Female wood-carder bees get about their business bothering no other insect, they are even quite shy and easily disturbed. They emerge more or less at the same time than males, sometime in June and set about nesting in some pre-existing cavity. Their cottony nests were described in the early 20th century by the French entomologist, Jean Henri Fabre in his book 'Bramble Bees and Others' as 'by far the most elegant known specimen of entomological nest-building'. Fabre was a curious naturalist, especially fascinated by bee nesting habits and encouraged solitary bees to nest in reed stems and glass tubes so that he could observe them in action. 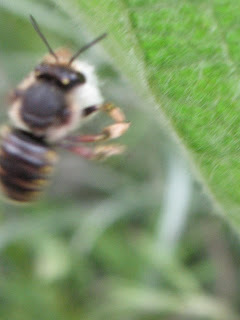 "Faithful to the plant recognized as yielding good results, the Anthidium arrives and resumes her gleaning on the edges of the parts denuded by earlier harvests. Her mandibles scrape away and pass the tiny fluffs, one by one, to the hind-legs, which hold the pellet pressed against the chest, mix with it the rapidly-increasing store of down and make the whole into a little ball. When this is the size of a pea, it goes back into the mandibles; and the insect flies off, with its bale of cotton in its mouth." 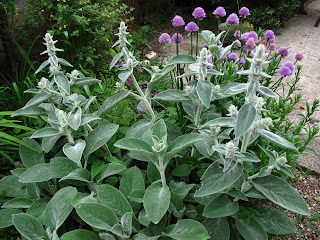 This is the Stachys byzantina, still intact today, waiting for the shaving of the bee. Cool. :-) I just love your blog! 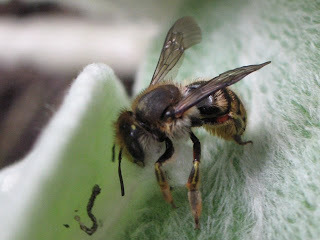 Do you know anything about the range of wool-carder bees in the states? I keep thinking I see them here in Washington, and then I think I'm just crazy. Thanks for any help you can give. This introduced species lives in disturbed habitats and visits Old World garden flowers and weeds.